Ooh! I love both of the wreaths! I think a fall wreath is going to have to be a must this year! I love the #4 wreath (I'd be too tempted to eat #6, LOL) ;-) I can see #4 in pastels for spring, greens for St. Patty's day, red/white/blue for the 4th...ENDless addicting possibilities!!! oh my gosh. i am so in love with the yarn wreath! 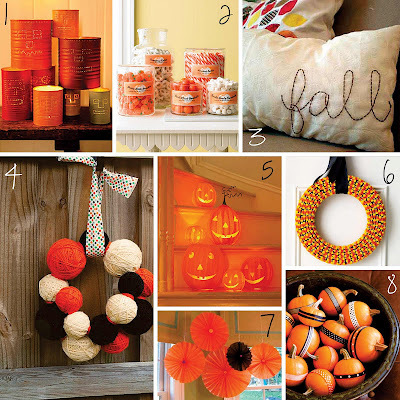 i don't really decorate for Halloween much but i would looove it in Christmas colors. What great DIY projects. I'm bookmarking a bunch of these.